For the amazing 1:350 scale original series USS Enterprise. Specially designed with lighting in mind, this photoetch includes light-blocking masks for the bridge, landing bay and fantail. Bridge pieces include the control panels as well as series and first pilot versions of the display panels. Decals are included for the pilot version while the series panels work the decals included in the kit. Two versions of the bridge railings are also designed for first pilot and series versions. Crew is included at 1:350 scale, plus 3/4 that size to fit in the shuttlebay and bridge. ShadowCasters are printed on translucent film and can be placed behind the windows to add the appearance of depth. Strips are also included that fit into the “windmills” in the warp engine nacelles. 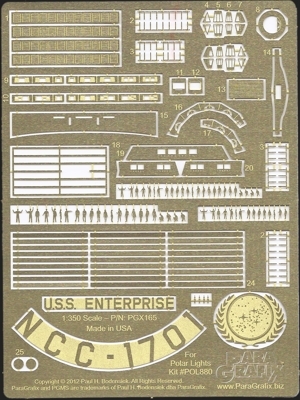 NOTE: The warp nacelle, warp pylon, and impulse engine grills are included in our photoetch set PGX208. FOR KIT: POL880, POL934 etc. This item is on Preorder status. Sending in the following form is a commitment to purchase at the price stated below. When the item is in stock and ready to ship, you will be sent a PayPal invoice. Payment of this invoice is required within 7 days to retain preorder priority. Please note that because of logistics, at this time ParaGrafix does not accept preorders via any method other than a PayPal commitment. We appologize for the inconvenience. Click Here for the Preorder Email Form. Please allow 2 to 3 weeks for availability. This delay will not affect any other products you order in this session.